Nokia, at an event in Moscow on May 30, announced three smartphones named Nokia 2.1, 3.1 and 5.1. As the names indicate, these three are the upgraded versions of last year’s Nokia 2,3 and 5 respectively. 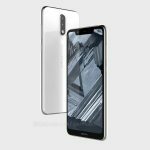 But, looks like we are going to get some more phones this year from Nokia as the Nokia 5.1 Plus renders based on Factory CAD were revealed by reputed leakster Steve Hemmerstoffer aka OnLeaks. The renders clearly show that Nokia is all set to follow the similar design language for its upcoming devices. Just like the Nokia X6, the Nokia 5.1 Plus is coming with a notched display. As the images above show, the 5.1 Plus looks exactly similar to the Nokia X6, whether it is that glass and metal design or the dual rear camera setup. The difference that you are going to notice on comparing these two phones is the size of the notch on top. The one on Nokia X6 is smaller than the one on Nokia 5.1 Plus. Rest of the design is the same, including the buttons and ports placement. So, is Nokia going to launch the Nokia X6 as the 5.1 Plus in the global market? Well, who knows! There is no information regarding the specifications yet, but we do know that the dimensions are 149.5 x 71.9 x 8mm (8.8mm including rear camera bump) and the display is about 5.7-5.8-inch (Nokia X6 has a 5.8-inch display). We hope that Nokia will move on from the MediaTek chipsets and we are going to see a Snapdragon chipset powering the 5.1 Plus.